Chillingo's new tower-building game in a nutshell. Assuming this isn't your first tower-building game, you'll already be very familiar with the core gameplay of Happy Squirrels. First you choose to construct a floor, then you choose the building type, and then you wait for your workers to complete it. You can use a potion currency to complete the work instantly, but you only have a handful of these of course, with more available in exchange for your cash. There are four categories of levels to choose from when building the next tier of your tree. Some of these floors provide essential services, while others focus on more fun diversions like saunas or even bookshops. You'll need to balance your expansion plans with the wants and needs of the little squirrels who give you thought-bubble hints about what they'd prefer you to build next. As time passes, each outlet will earn you a certain number of the game's currency of nuts, which go straight back into the pot for your next expansion. If you're finding your nuts-per-minute ratio horribly unproductive, you can upgrade shops to be a little more efficient, but these again take time to complete. Once you've given a sizable chunk of your life to a tower-building, it's hard to engage with another and start from scratch all over again. Increasingly we see developer's add extra little gameplay flourishes to retain your attention and make the whole process just a little more interesting during construction down-time. 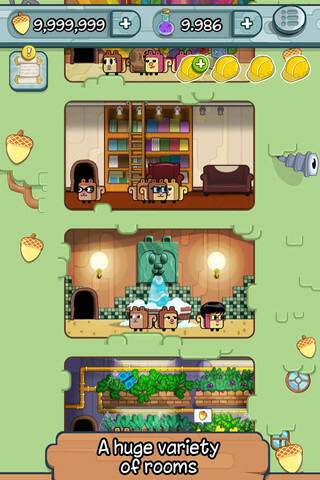 In Happy Squirrels, your tree will sprout nuts and potions which can be collected with a tap of the screen, and there are simple mini-games you can take part in if you want to grab a few more. 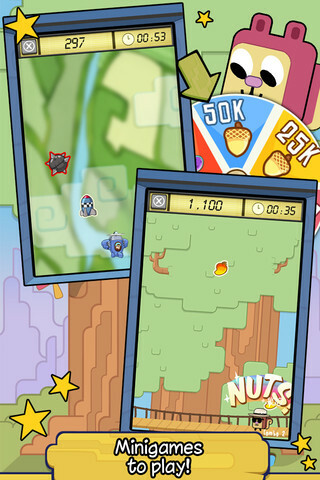 Nut Catcher can be played at any time you wish and you use tilt controls to guide your squirrel back and forth, catching fruit and nuts from the sky while dodging insects. You'll have to wait for a train of colorful planes piloted by squirrels to roar past if you want to take part in Acorn Ace. Once in, it's again a tilt-controlled mini-game where you need to steer your little plane passed mines, gather rockets for speed boosts, and gather up any stray nuts you come across. While in many ways the game feels like a lite version of some of the more in-depth tower building games you might have played, the flip-side is that this is a more accessible version of the game, one that children will find much easier to get to grips with. Whether designing a cute and colorful wallet-fed Skinner box for that sort of market is a good thing or not, we'll leave to your own personal opinion. 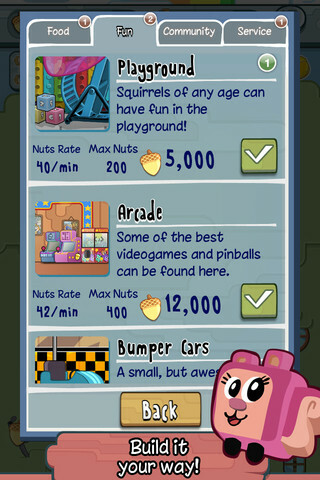 Artwork and light-heartedness aside, the core tower-building of Happy Squirrels doesn't bring a whole lot of new content to the genre, but the mini-games take the interactivity of these thumb-twiddling titles to a slightly higher level. You may not think you have enough time for another game in this mold, but until you've enjoyed the new features it brings, you can't really say you've sampled everything the genre has to offer. What's Hot: The core tower-building component is competent if not exactly revolutionary. Mini-games are a very welcome addition to the genre and add some much-needed hands-on gameplay. What's Not: This is very much tower-building as you know it, with a rather simplistic approach to expansion.